The TRI Summary report provides a summary of the recent threat risk index (TRI) scores of your environment, including the overall TRI score and trends, score details, risk index asset distribution charts, and top ten lists. Use this report to enable a proactive risk management approach and prioritize risk mitigation efforts on specific areas in your environment. This report is composed of the two pages, TRI Summary page , and the Top 10 Lists page. To see the Top 10 Lists page, click the arrow icon ( ) on the top right of the TRI Summary page. In the Alert Logic console, click Reports, and then click Risk. Click Threat Risk Index, and then click TRI Summary. To refine your findings, filter your report by Customer Account, and View Previous Days. By default, Alert Logic includes (All) filter values in the report. Click the drop-down menu in the filter, and then select or clear values. This section provides the overall TRI score in the selected filters. This section provides the daily TRI score trend for the 14 days prior to the current day. This section provides the total number of vulnerabilities, number and percentage of vulnerabilities with known exploit code available, the number and percentage of internet- facing vulnerabilities found in external scans, and the number and percentage of hosts that were last scanned more than seven days prior to ago in the selected day. This sections displays the correlation of TRI scores and total vulnerabilities for the selected day represented in a scatter graph and a list. You can view the correlation of TRI scores and total vulnerabilities from deployments or VPC/networks. Click the Asset Type drop-down menu on the top right of the graph, and then select the asset type you want to see. The list displays the name of the deployment or the VPC/network, the associated risk level, the TRI score, and the vulnerability count. To refine the list, select one or more circles in the scatter graph to the left of the list. 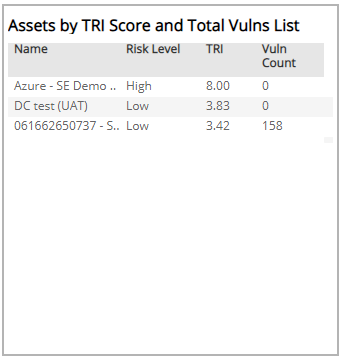 You can also click on a name in the list to filter by the selected asset in the scatter graph and filter data in the Threat Index, TRI Score Trends and TRI Score Details for the selected asset. 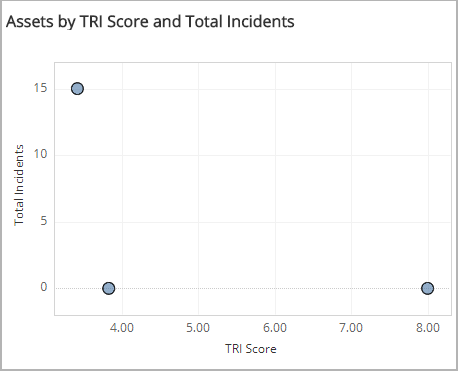 This section displays the correlation of TRI scores and total incidents in the selected day represented in a scatter graph and a list. You can view the correlation of TRI scores and total incidents from deployments or VPC/networks. 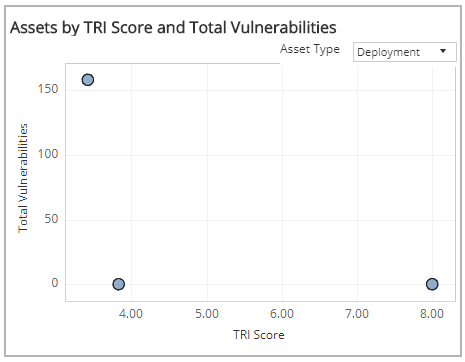 Click the Asset Type drop-down on the top right of the graph in the Assets by TRI Score and Total Vulnerabilities section, and then select the asset type you want to see. 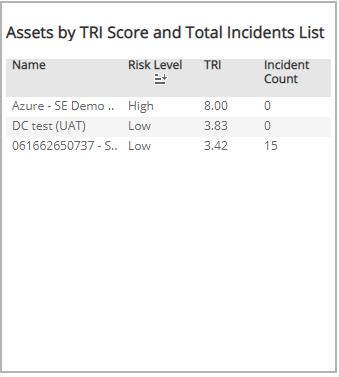 The list displays the name of the deployment or VPC/network, the associated risk level, the TRI score, and the incident count. To refine the list, select one or more circles in the scatter graph to the left of the list. To see the Top 10 Lists page, click the arrow icon ( ) on the top right of the report. 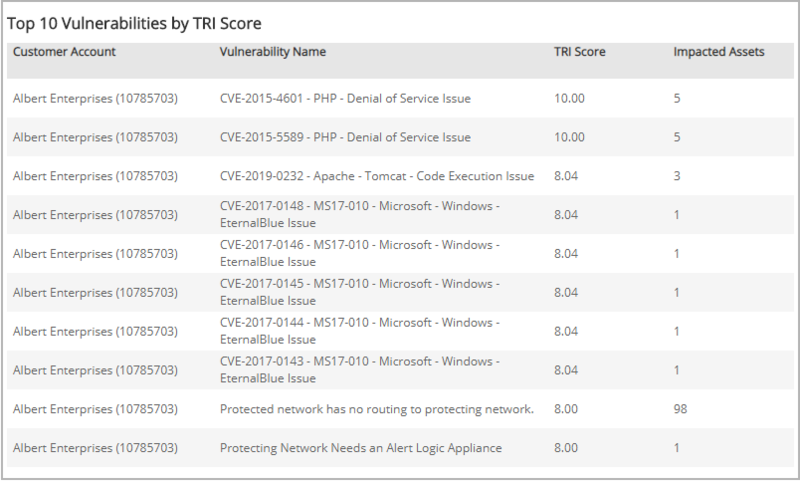 These sections provide top 10 lists of your most vulnerable hosts by TRI score, and the top 10 vulnerabilities by TRI Score. your report by Customer Account, Deployment Name, View Previous Days, and VPC/Network. Some filters allow you to include or exclude all selected values in a filter for quick refining. Click the drop-down menu next to the filter icon ( ), and then select Include Values or Exclude Values. 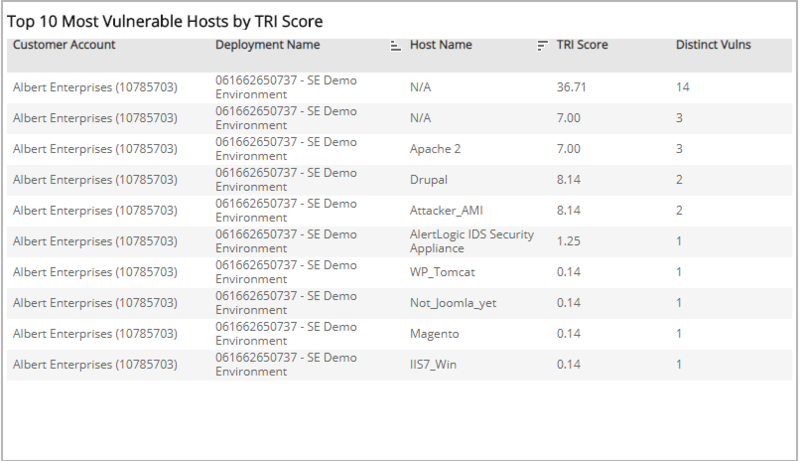 The list displays the 10 hosts in your environment with the highest TRI scores for the selected day. The list is organized by customer account, deployment name, host name, TRI score, and the distinct vulnerabilities in that host. The list displays the 10 vulnerabilities in your environment with the highest TRI scores on the selected day. The list is organized by customer account, description, TRI score, and number of impacted assets.